I have been craving Mexican food lately, and after making the pork tostadas, which I topped with a diced avocado – I really wanted some homemade guacamole. And considering I had a huge bunch of fresh cilantro to use up – this was perfect timing. Well there is not much that compares to the taste of fresh guacamole, and this was so good that I actually made another batch of it again already! I am getting way ahead of my blog! 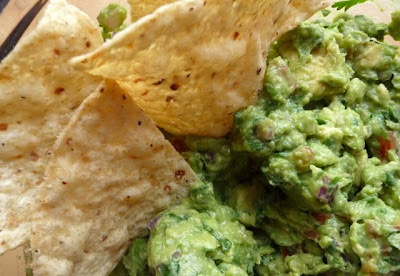 The great thing about guacamole is that you can really customize it to your tastes and what you have on hand. The recipe below is what I consider the perfect combination of ingredients. Enjoy! 1. Cut the avocado in half and remove the pit. Cut the avocado while it is still in the skin (check this out if you’ve never diced an avocado) then scoop the avocado out and into a bowl. 2. Mash it with a fork and then add the onion, jalapeño, and garlic and mash a little more. 3. Stir in the cilantro, tomatoes, lime, cumin, salt and pepper to taste. 4. Refrigerate to let the flavors meld. Place plastic wrap directly on the guacamole, and stir again when ready to eat (it’s ok if it turns brown).